X Its lips are the most sensitive part of its body. It always uses its lips first to examine things. X Die Lippen sind sein empfindlichster Körperteil. Neue Dinge untersucht es zuerst damit. X Ses lèvres sont la partie la plus sensible de son corps. Il les utilise pour examiner les objets. X Sus labios son la parte más sensible de su cuerpo. Siempre los usa para examinar las cosas. X Le labbra sono la parte più sensibile del corpo, il primo organo con cui analizza nuovi oggetti. X 입술이 제일 민감하다. 뭐든지 먼저 입술로 건드려서 어떤 것인지 확인한다. Y It tests everything by touching with its lips, which remember what it likes and dislikes. 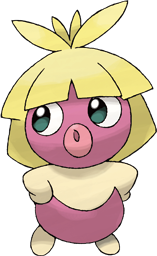 Y Dieses Pokémon berührt alles mit den Lippen. Diese merken sich, was es mag und nicht mag. Y Il goûte à tout du bout des lèvres. Elles gardent en mémoire ses goûts et ses dégoûts. Y Analiza todo tocándolo con los labios. Así puede recordar las cosas que le gustan y disgustan. Y Analizza tutto con le labbra e con esse riesce a memorizzare ciò che gli piace e ciò che non gli piace. Y 무엇이든 입술로 건드려보고 확인한다. 좋아하는 것도 싫어하는 것도 입술이 기억하고 있다. Omega Ruby Smoochum actively runs about, but also falls quite often. Whenever the chance arrives, it will look for its reflection to make sure its face hasn’t become dirty. Omega Ruby Kussilla läuft hektisch umher, fällt aber auch ziemlich oft hin. Es lässt keine Möglichkeit aus, sein Spiegelbild zu betrachten, um sicherzustellen, dass sein Gesicht nicht schmutzig geworden ist. 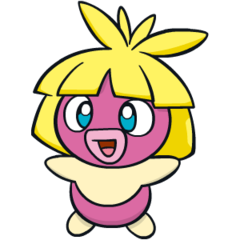 Omega Ruby Lippouti court dans tous les sens et tombe assez souvent. Quand il en a l’occasion, il regarde son reflet dans l’eau pour vérifier si son visage n’a pas été sali par ses chutes. Omega Ruby Smoochum va corriendo por todos lados, pero se cae también con frecuencia. Y, en cuanto tiene ocasión, se mira en algún sitio para ver si se ha manchado la cara. Omega Ruby Smoochum scorrazza vivacemente, ma spesso inciampa e cade. Così, appena può, cerca di specchiarsi da qualche parte per assicurarsi di non essersi imbrattato il volto. Omega Ruby 기운차게 돌아다니지만 자주 넘어진다. 벌떡 일어나서는 호수의 수면에 얼굴을 비추고 더러워지지 않았는지 살핀다. Alpha Sapphire Smoochum actively runs about, but also falls quite often. Whenever the chance arrives, it will look for its reflection to make sure its face hasn’t become dirty. Alpha Sapphire Kussilla läuft hektisch umher, fällt aber auch ziemlich oft hin. Es lässt keine Möglichkeit aus, sein Spiegelbild zu betrachten, um sicherzustellen, dass sein Gesicht nicht schmutzig geworden ist. Alpha Sapphire Lippouti court dans tous les sens et tombe assez souvent. Quand il en a l’occasion, il regarde son reflet dans l’eau pour vérifier si son visage n’a pas été sali par ses chutes. Alpha Sapphire Smoochum va corriendo por todos lados, pero se cae también con frecuencia. Y, en cuanto tiene ocasión, se mira en algún sitio para ver si se ha manchado la cara. Alpha Sapphire Smoochum scorrazza vivacemente, ma spesso inciampa e cade. Così, appena può, cerca di specchiarsi da qualche parte per assicurarsi di non essersi imbrattato il volto. Alpha Sapphire 기운차게 돌아다니지만 자주 넘어진다. 벌떡 일어나서는 호수의 수면에 얼굴을 비추고 더러워지지 않았는지 살핀다. Gold Its lips are the most sensitive parts on its body. It always uses its lips first to examine things. Silver It always rocks its head slowly backwards and forwards as if it is trying to kiss someone. Stadium2 Its lips are the most sensitive parts on its body. It always uses its lips first to examine things. Ruby Smoochum actively runs about, but also falls quite often. Whenever the chance arises, it will loo for its refelction to make sure its face hasn't become dirty. Sapphire SMOOCHUM actively runs about, but also falls quite often. Whenever the chance arrives, it will look for its reflection to make sure its face hasn't become dirty. Emerald It actively runs about, but also falls often. Whenever it falls, it will check its reflection on a lake's surface to make sure its face hasn't become dirty. Pearl It tests everything by touching with its lips, which remember what it likes and dislikes. Platinum It tests everything by touching with its lips, which remember what it likes and dislikes. Black It tests everything by touching with its lips, which remember what it likes and dislikes. White It tests everything by touching with its lips, which remember what it likes and dislikes. White 2 It tests everything by touching with its lips, which remember what it likes and dislikes.